This was posted on February 22, 2014 by Sarah Maxwell. Today I helped Christopher with newborn photos of Ruthanne. We also did a special photo session with the girl cousins. Their headbands are all from Snugars.com, a great company founded by homeschooled young ladies. I can’t wait to share other photos from our session later. Girl cousins left to right: Christina, Abigail, Ruthanne, and Bethany. What a sweet photo! Can’t wait to see the rest! Lovely lovely little ladies! <3 So blessed by their smiles and this photo tonight. 🙂 Thank you! That is such a beautiful picture. Love the denim against the white background. Abigail is such a big girl so now. She looks so at ease holding Ruthanne. Bless the children, oh Lord. Awwww, so sweet! Can’t wait to see the rest of the photo shoot. Ruthanne is taking a nice snooze — so hard to catch the wee ones with their eyes open that first week or so! 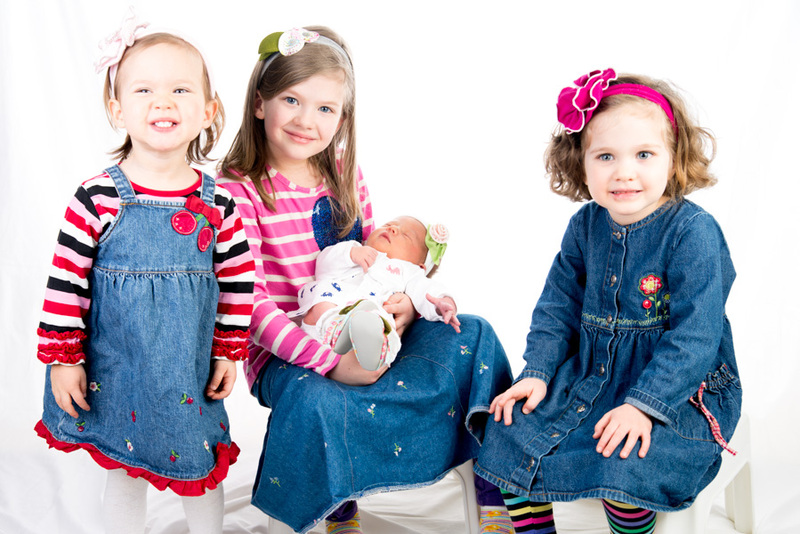 Beautiful girls, cute headbands and tights and little shoes on Little Miss Ruthanne. The girls are all so adorable. Abigail is growing into a little lady!